My experience with all of Margaret Atwood's books has always been that they start off slowly, setting the scene in almost a plodding manner. Like a snowball rolling downhill, page by page her genius becomes more and more evident until by the end of the book I am overwhelmed by her cleverness. Every single time. I now know that I need to stick with it, no matter my mood, because it will all come together and knock my socks off. Her writing is like some kind of a puzzle photo; hundreds or thousands of tiny photos placed together and when you back up you realize that all together they have made one giant, miraculous, gorgeous photo of its own, nuanced and intricate and just plain clever. I'm not going to summarise the story except to say that this is a novel set in the not too distant future at a time when the division between the corporate "haves" and the plebian "have-nots" is complete. There is undercurrent of rebellion and sabotage, but the totalitarian society has virtually complete control. Margaret Atwood's nuanced language always makes me want to turn back to the first page as I finish one of her novels just to fill in all the blank spaces. Those blank spaces can be frustrating the first time through if you get too caught up on trying to know all, and asking too many questions as you go. 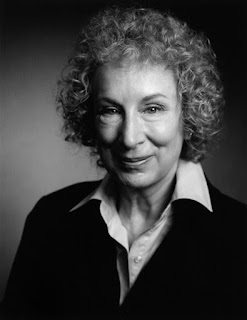 Margaret Atwood's writing definitely rewards close reading and re-reading (my favourite kind of books). Although I found the stories of Oryx's childhood very tense reading (fearing I was going to be reading something I did not want to read), my delicate sensibilities were not offended in the least. In fact, it just made me love this book even more. 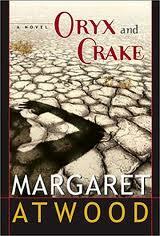 I thoroughly enjoyed this novel and will be searching out The Year of the Flood, the sequel to Oryx and Crake.